polished sapphire crystal case, sapphire crystal with anti-reflective treatment, HUB 9005.h1.pn.1 manual-winding movement with suspended vertical tourbillon, approximately 50 days of power reserve, transparent smooth rubber strap, polished sapphire crystal and microblasted black-plated titanium deployant buckle. Water resistant to 30 m.
microblasted black PVD titanium case, sapphire crystal with anti-reflective treatment, skeleton dial, HUB9005 manual movement with suspended vertical tourbillon 11 series-coupled black-coated barrels, approximately 50 days of power reserve, black smooth rubber strap, satin-finished and microblasted black PVD titanium deployant buckle. Water resistant to 30 meters. 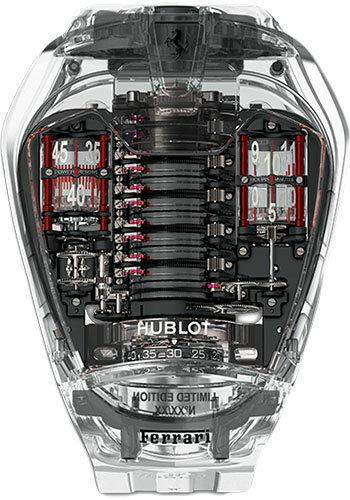 Microblasted titanium case, sapphire crystal with anti-reflective treatment, LaFerrari dial with hour and minute indicated by anodized black aluminium cylinders on the right side, seconds indicated by anodised black aluminium cylinder fastened on to the suspended tourbillon, power reserve indicated by anodized black aluminium cylinder on the left side, HUB9005 manual winding movement with suspended vertical tourbillon and 11 series-coupled barrels, approximately 50 days of power reserve, black smooth rubber strap, satin-finished titanium and microblasted black PVD titanium deployant buckle. 45.8 x 39.5 mm yellow gold, titanium, PVD coating case, sapphire crystal with anti-reflective treatment, black dial, HUB9005 manual movement with suspended vertical tourbillon 11 series-coupled black-coated barrels, approximately 50 days of power reserve, black smooth rubber strap, titanium buckle. Water resistant to 30 meters.